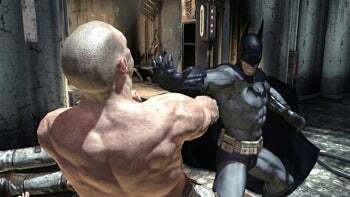 The Batman Arkham Asylum demo's out for Xbox 360 owners, it's about 1.54GB, I've pulled it down and had a look, and what can I say, "I'm Batman." That's about all I can say, however, since it's over before it's really begun, and what's there to see doesn't add up to enough, frankly. It's a couple rooms in a madhouse, a few toss-around fights and some cable-swinging, about half-time spent listening to allied audio briefs or watching the Joker and his goons mug for the camera. First up, there's an introductory video that plays if you leave the splash screen alone, a plot summary narrated by a mediocre Christian Bale imitator (possibly a compliment, of course, if you think Christian Bale with laryngitis is god). 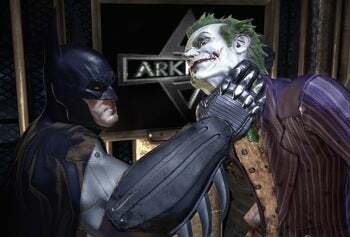 The game's title gives the story up: Mr. Batman Goes to Looney Town. You're locked in from the get-go, the game's impetus amounting to a battle-laced building-crawl where you confront combat or logic challenges thrown up one after another. If you're after DC Universe dossiers, an "info card" view dishes on heroes and villains alike, listing powers and origin stories with occasional media clips. The Joker's is predictably over the top, in the vein of the Paul Dini scribed animated series (though the heavily muscled, rubberized, Alex-Ross-realism-style clashes with the cornball dialogue and voice acting). The Joker's card sports a few tape reels of counseling sessions, but the warped audio reverb effect makes it hard to understand what he's saying--the equivalent of listening to a thespian prattle down a length of pipe. The other view, a "trophy room," lets you study the game's character models up close from any angle. Batman looks like his latest incarnation in the Nolan films (nee Burton, nee Miller) with those furrowed brow lines and arched eyebrows permanently etched into the cowl, lending him that customary air of melodramatic menace…or the look of a man who's irascibly constipated. Incidentally, doesn't Batman shave? I guess a five o'clock shadow's supposed to signify "slightly unhinged." It kept drawing my attention for some reason. Where's a Bat-Norelco when you need one? Once the game hands control over to you, you'll learn how to punch, perform martial reversals, fling your bat-boomerang, and grapple between decoratively wacky protrusions. After fumbling for the first minute or two, you'll realize they've Zelda-fied your tactical input, i.e. you can't jump (what next, a guide spirit named Navi?). Come to think of it, Batman rarely leaps around in the films (more like "swoops" and "pummels") but still…isn't he supposed to be the world's greatest martial artist? Don't tell Jackie Chan or Yuen Woo Ping. 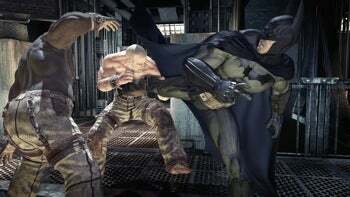 The rest unfolds in sequence: Punch a handful of lunkheads out, grapple between gothic protrusions to elude or swing around troupes of goons, wriggle through an air duct to escape a cell block, employ stealth takedowns (based on position) to surprise gunners, etc. It feels a bit like sprinting (well jogging, actually, with a huge billowy cape flapping in your face) over hurdles thrown up one at a time, and don't step out of your lane. I was actually hoping for something more along the lines of the sandbox-in a-mall flex of Capcom's Dead Rising. Instead, the game endeavors to be a moody brawler with a few clever superhero angles, but it's hard to find any one element in the demo that says "For this, I must play the full thing." I like the way enemies display a visual cue when they're about to attack, so that you have time to react--first time I've seen that, in fact. Fights slow up deliberately, giving you welcome time to admire the choreography, which lends individual confrontations more intimacy. The "detective mode" view works a bit like the scan visor in Metroid Prime and has logistical promise--it's just not tapped enough to say how much here. And that's my take-away: Not enough to nudge me in either direction, though I'll be watching other reactions with interest. The full version arrives August 25 for Xbox 360 and PlayStation 3, and September 15 for Windows.